Bon Jovi superfan and presidential candidate Barack Obama today said that his campaign “would not be bullied.” He issued this statement at a Bon Jovi concernt, in front of dozens of NJ residents. Obama can hear music 5 miles away. 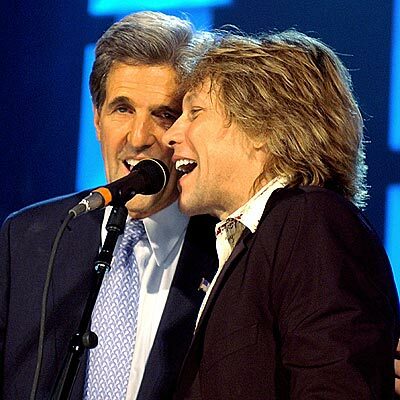 In 2004, rocker Bon Jovi helped John Kerry all the way to 2nd Place in the Presidential contest! Obama added that they were not going to be smeared or lied about. Sarah Palin - Slippery When Wet? Or just a Blaze of Glory? < Previous Oprah – Pro-Obama, not Pro-Mamma – Sarah Palin denied by the O?